Simple – check; Easy to make – check; Tasty – check. 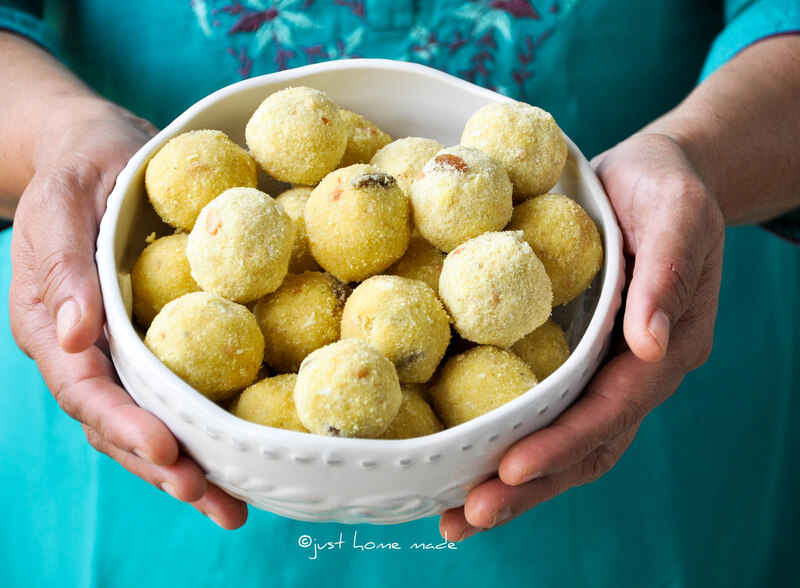 In comparison to all other traditional South Indian sweets, this one is distinct – in its simplicity, ease of preparation as well as minimal active cooking required. There couldn’t be a sweet more humble than Rave Unde. Let’s just say it is. And because it involves shaping dough like mix into balls, it makes a perfect no-fuss preparation to involve your little budding chef(s) in the kitchen as your assistant. It’ll be fun, I promise! I normally don’t make open promises like I just did. Not that I can’t keep them, but let’s just say I don’t. I just go about doing things. Anyway, there’s a reason I said that for. The few times I remember distinctly when Rave Unde was sure to be made at home was during Gokulashtami (festival celebrating Lord Sri Krishna’s birth). To us, this was a festival of gastronomical proportions where sweets and savouries of at least twenty varieties were lined up as an offering to the Lord. And, a huge joint family meant that any help from all members of the house, irrespective of age, however small the contribution, was greatly appreciated. Now comes the fun part. And when Rave Unde was to be made, the main cook (my aunt) and her associates (her younger sisters) would be less interested in ‘menial’ jobs like shaping the dough mix into balls. That is where we (my brothers too) would happily pitch in and feel proud to have been part of the festival kitchen conundrum. Those are a few of my most cherished kitchen memories from childhood. Now, you get my promise? If you can keep this between us, let me tell you something. If I can count one sweet food I hated the most, growing up, it wouldn’t be any other than Rave Unde. I know, right? But, times have changed and so have I. To be honest, I have surprised myself by my increased liking for it and more so, the number of times I have made it more than I expected. 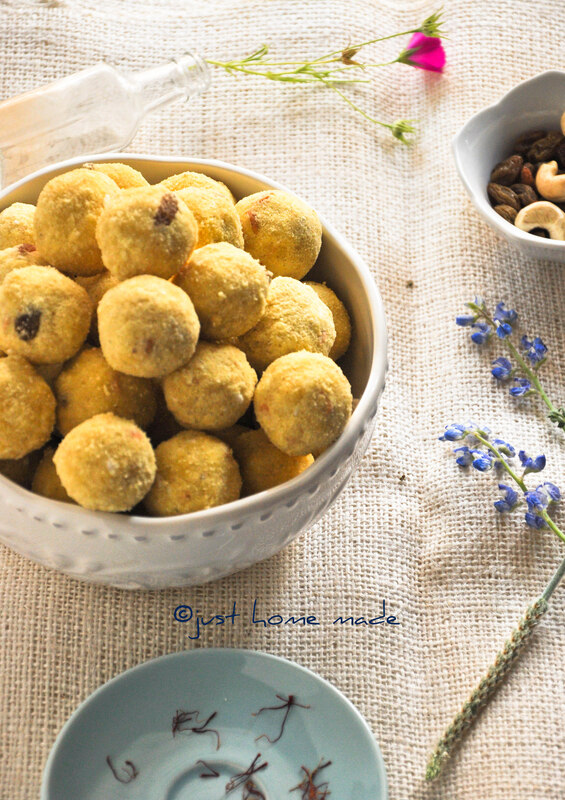 psst: I ate Rave Unde as a child only for the cashews and raisins in them!. So, those are indispensable, if I must say. Cardamom and Saffron are such classic eastern flavors. Saffron lends the faint sunshine yellow color to Rave Unde along with its mellow floral aroma. Every time I crush saffron between my finger tips, however caught up I am in the recipe, I pause for a few seconds (if not for minutes) to smell its pleasantly out of the world aroma – it feels as if I am smelling a beautiful golden red sunset! Skip if you must, but what is a sweet with its aroma and hue stripped? Totally out of context, yet it will be a shame if I don’t say a word about them. Those little dainty blue flowers my friend, are none other than the Texas Blue Bonnets. They are pretty big a deal here in Texas. April showers are expected to bring blue bonnets (not may flowers) here. Though this April saw a drought instead of the showers, we were lucky to spot a whole field full of them. Pretty pretty, aren’t they? I never met a Rave Unde that did not like raisins and cashews. This fruit and nut couple is a marriage made in heaven. Wherever they go as a couple, they are sure to transform anything they come in contact with. Need I say anything different for Rave Unde? That is my little girl’s hand trying to grab a cashew in between photo shoots. Just couldn’t keep from posting here. If you never ate Rave Unde once, there’s absolutely no harm in trying it. Assuming you are familiar with it, what kind of nostalgic childhood memories do you associate with Rave Unde? Keep the cashew bits about half the size of a raisin. I use kitchen scissors or a traditional Indian nut cracker for this job. 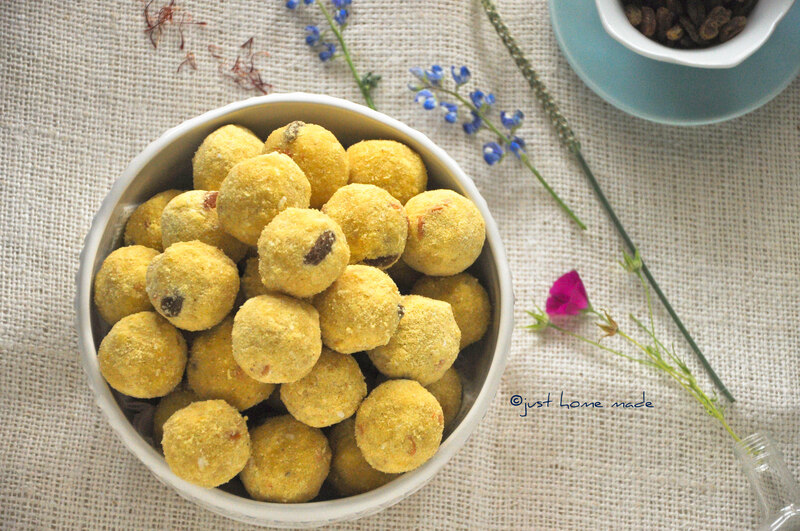 Wash and pat dry golden raisins. 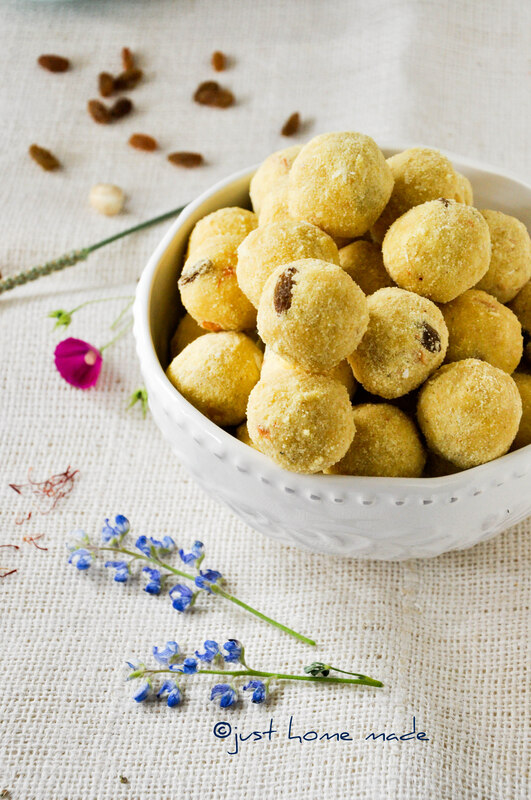 If not for the dirt, it makes them softer for the semolina balls to hold them well without dropping out. A mortar and pestle brings out the best freshly ground cardamom. The one I have is of marble and I bank on it for all such small grinding work. If using frozen coconut, thaw in the microwave for 10-20 secs or let sit on the counter for 30 mins before use. If milk is not pasteurized, bring it to a boil else heat milk until just steaming either on a stove top or in a microwave. 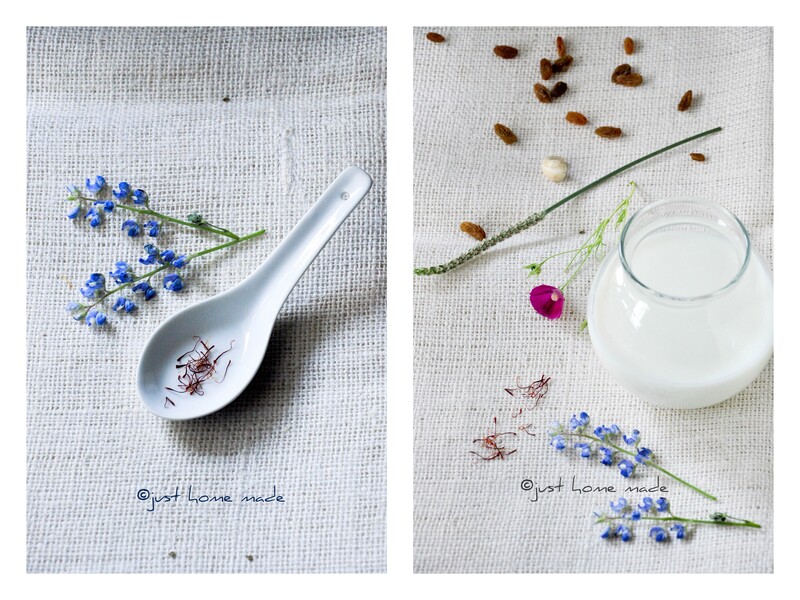 Crush the strands of saffron between your finger tips into the milk, cover and let sit to infuse. Heat ghee in a heavy bottomed pan or kadai on medium-high heat. Do not let the ghee smoke at any point. When ghee is hot enough or shimmering, add broken cashew bits and fry until just golden brown. Strain and keep aside. To the same hot ghee, add fine semolina and roast on medium heat until fragrant and golden brown. Remove into a large mixing bowl. Even though it might seem like forever, try not to increase the heat higher or owing to its fine grade, rava/sooji will get burnt. To the same kadai, add freshly grated coconut and roast until fragrant and all the moisture is gone. Remove on to the roasted rava. 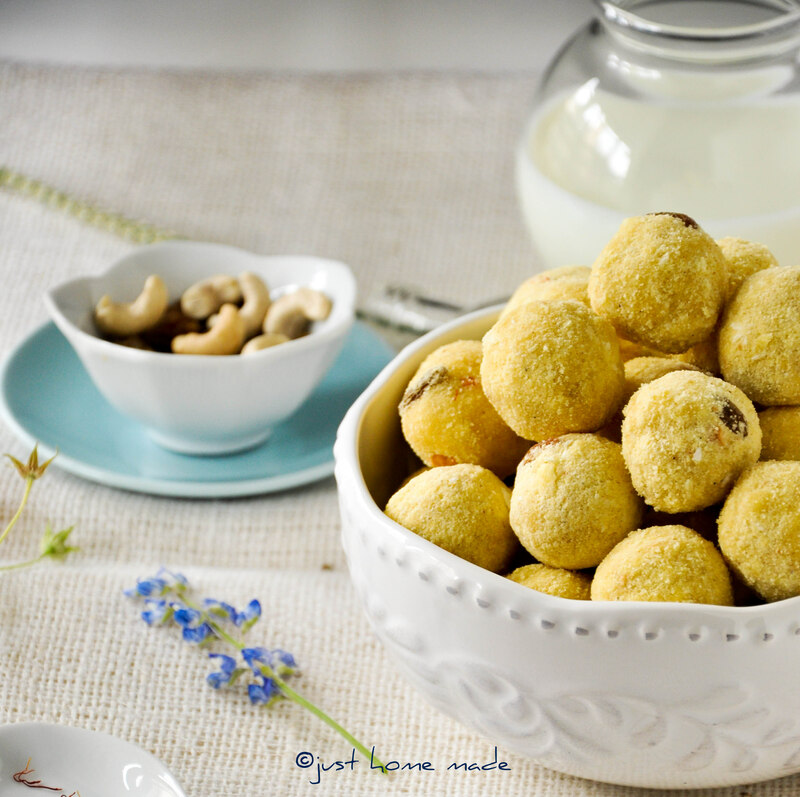 Add washed golden raisins, fried cashew bits, ground cardamom, powdered sugar and give a good stir to mix all the dry ingredients well. Spoon some of this dry mix onto the bowl or plate of fried cashews and scoop away any residual ghee. There's no place for wastage in an Indian kitchen! Now for the main part, divide the dry mix into two sections. Make a small well in one part of the mix and add milk a tbsp at a time mixing fast simultaneously until you can just mold into a ball with your fingers and cupped palm. Too much milk and you'll find it is very easy to mold, but when cooled Rave Unde will turn out to be rock solid and hard to bite as you can imagine. The right consistency is when it can hold its shape but crumbles on pressure. 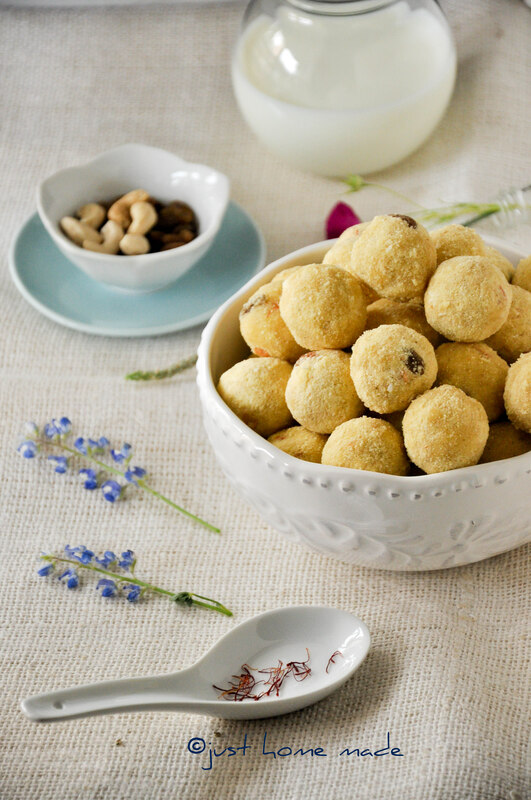 If you get this right, Rave unde should melt in the mouth and then you'll get to bite on the fried cashews and soft golden raisins. To make a perfect round ball, first cup in your palm, roll and move with your fingers while applying pressure within the cupped palm until it appears round enough. Arrange all the balls on a plate and let cool. Store in an airtight container when cooled and consume within 3-4 days. Do not mix all the milk at one time, just go with one tbsp at a time. Do not substitute ghee with oil preferably. The sweet nutty flavor of ghee is a must addition to the taste of Rave Unde. Avoid using granulated sugar as it will not blend with sooji/rava as well as powdered sugar. Cardamom is best when freshly ground. Avoid buying ground cardamom from the store, as it loses its fragrance on the shelf rather quickly. Though people do make it even with Upma rava/sooji which is a thicker grade of rava, I prefer to make it only with fine rava for its melt in the mouth texture. Desiccated coconut is a good alternative to fresh grated coconut, if not available. Lovely recipe! And the photos are amazing! Love the bright, colorful images. You really capture springtime in these fun shots. 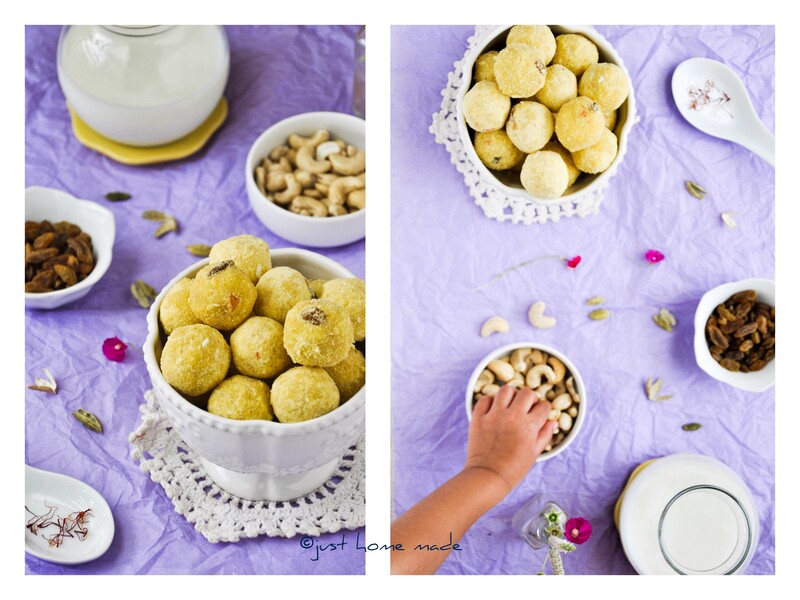 I have to admit that I struggle with Indian sweets sometimes (okay, most of the time). They take sweet to a new level! And I think it is also the ghee that really makes them rich. If I cut the sugar and ghee down a bit, will the recipe still work? Guess, Indian sweets are an acquired taste to many who aren’t used to the levels of sugar that sometimes can be. I myself find it a saturating taste and stick to under usage of sugar in most of my recipes. And that applies to this recipe as well. same goes to ghee too. That said, please feel free to experiment with the sugar and ghee proportions. Try reducing the sugar to 3/4 cup. Too little sugar and it might just taste sandy! You need to find a way to sell these beauties and I’ll be your first buyer! Oh! That must be quite tasty, I’m sure.. If you love butter, you’ll love the fragrant nutty aroma of Ghee as well.. Awesome recipe. Very easy to follow with pictures.